A renewed passion for poster art in the early 1990s manifested itself as a business venture called the Poster Project, LTD. Several creative streams flowed from the small Poster Project office in Aurora, Missouri. One of his most ambitious undertakings was the organization and implementation of the Poster Expos in San Francisco. These Expos, which ran from 1992 to 1994, were a means of bringing the poster art community together again. This annual event is still in existence as the annual Festival of Rock Posters in San Francisco because of the dedication and leadership of the The Rock Poster Society. Along with the Rock Art Expos in San Francisco Wes created a journal of poster art, poetry, and ideas that he called OFFtheWALLTM. This publication was another venue for sharing event poster art with the art community. 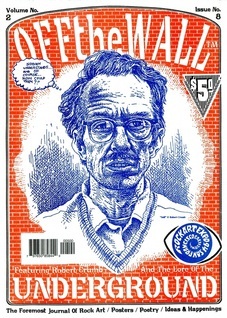 This visually rich publication started in 1991 when Wes created the first issue on his little Macintosh SE. The nine-issue publication showcases event posters, rock and roll events, poetry and prose, while also specializing in new and subversive ideas. Always on the lookout for new creative outlets, Wes also used the Poster Project, LTD. as a vehicle to promote artistic endeavors and bring attention to progressive causes in the Ozarks foothills that he now called home. The Poster Project, LTD. was in existence from 1991 to 1995.